Laura McLeod helps students understand the importance of making connections to find the right job. Laura McLeod, assistant professor of practice in marketing, knows the power people can exert when they strengthen their communication and selling skills. Amidst a professional background working in both big and small companies, she joined the College of Business in 2016, intent on giving students enrolled in the undergraduate certificate program in sales excellence the maximum opportunity to succeed. McLeod specializes in working with students in the sales program. One of her greatest joys is seeing the results when students are able to use their selling skills to land the right job. Working in the corporate environment at The Coca-Cola Company, as well as Nature’s Variety when they were a local startup, McLeod knows the differences between managing a recognizable brand and creating awareness for an emerging product in the marketplace. It can be crucial for getting students to think about how they want their future careers to look. The sales program continues to grow since being established in 2015. Any student at Nebraska may apply regardless of their major – although all students interested in the program must take Sales Communication (MRKT 257) as a pre-requisite. “There are students interested in going into sales full-time, and the program helps them develop skills to be very successful sales people when they graduate. There are also students who may not go into a sales position, but they may want to be an accountant, or an attorney or a dentist, and they realize that having sales skills is really important for client development. I love helping those students become more confident in their ability to sell,” said McLeod. 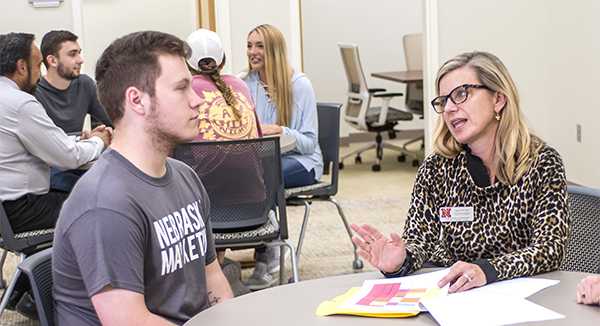 As the advisor to the Nebraska Sales Club, McLeod reaches additional students not necessarily working to earn a sales certificate in professional selling. After starting the student organization in the spring, the club is up to more than 50 members. McLeod joined the College of Business in 2016, intent on giving sales student the maximum opportunity to succeed. Dr. Ravi Sohi, Robert D. Hays Distinguished Chair of Sales Excellence, chair of the marketing department and executive director of the Center for Sales Excellence, presented McLeod the Departmental Teaching Award during the past year. He believes her professional experience shows up in the jobs students from the sales program receive upon graduation. “Laura has been a great addition both teaching classes and relating to students. She brings her practical experience to the teaching environment and the students love her for that. From a mentoring and advising point of view, the input she provides students is well received. They know what to do when they graduate and they trust the information they’ve received, because they are hearing it from someone who has industry experience,” said Sohi. To learn more about the Center for Sales Excellence, visit: https://business.unl.edu/sales.